In the run up to Christmas, there’s a star shining over the Lake District Wildlife Park (LDWLP) near Keswick, as the park team prepare for their first ever Live Nativity Event. From 28th November until Christmas Eve, schools and groups and park visitors are being encouraged to dress up and be part of their own simplified nativity story, with animals from the park taking centre stage. ‘Traditional Christmas’ is very much on the cards at the Lake District Wildlife Park, with traditional food and mulled wine served in the café and chance for children to soak up the festive spirit of Christmas at the unique nativity story performances. A diverse range of schools and youth groups are already lined up to see the park re-create the magic of the Christmas Nativity – live in their new Bethlehem set. The covered picnic area is being transformed this week in readiness for the month-long event. Costumes have been gathered (with plenty of extra shepherd and angel costumes), so children and teachers can dress up and be part of the performance, and the animals have been busy rehearsing for the launch. 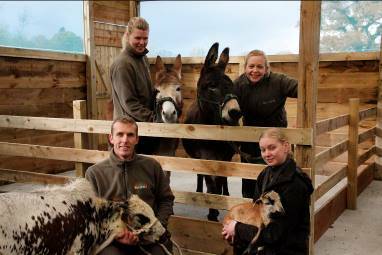 Rebecca Hvarregaard with Annie the donkey, Senior Keeper Vicky Jennings with Dooley the donkey, Richard Robinson, Park Manager with Neville the Zebu, Pernille Nowak with Earnest the Cameroon sheep. Richard Robinson, LDWLP Manager said “animals play a key role in any nativity story, so what better place to create the magic of Christmas than at the park. Those taking part this Christmas include Annie and Dooley the donkeys, Neville and Luna the miniature Zebu cattle and Earnest the Cameroon sheep. “We’ve been busy preparing for weeks and have really positive feedback from schools who are excited about coming along. Our narrator Fran Foster spends a lot of time working with children so we know she will make it a magical experience. Throughout the Christmas period, visitors to the park can enjoy a full day at the park, with additional craft activities and a Santa Trail to explore. During winter the park is open 10am – 4pm and is only closed on Christmas Day and New Year’s Day. The nativity event will naturally conclude on Christmas Eve, but the park is still open throughout the holiday season. 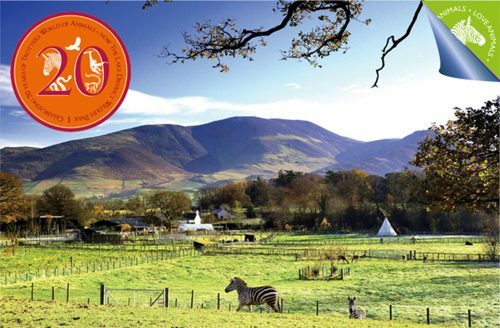 For all our guests staying with us at Lake District Hotels enjoy 2 for 1 entry at The Lake District Wildlife Park. See your in-room discount voucher sheet or ask reception for details.